Two donuts of seething radiation that surround Earth, called the Van Allen radiation belts, have been found to contain a nearly impenetrable barrier that prevents the fastest, most energetic electrons from reaching Earth. 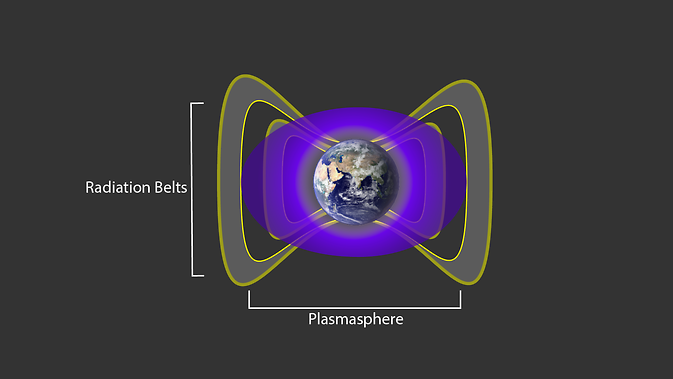 A cloud of cold, charged gas around Earth, called the plasmasphere and seen here in purple, interacts with the particles in Earth’s radiation belts — shown in grey— to create an impenetrable barrier that blocks the fastest electrons from moving in closer to our planet. The Van Allen belts are a collection of charged particles, gathered in place by Earth’s magnetic field. They can wax and wane in response to incoming energy from the sun, sometimes swelling up enough to expose satellites in low-Earth orbit to damaging radiation. The discovery of the drain that acts as a barrier within the belts was made using NASA’s Van Allen Probes, launched in August 2012 to study the region. A paper on these results appeared in the Nov. 27, 2014, issue of Nature magazine. The Van Allen belts were the first discovery of the space age, measured with the launch of a US satellite, Explorer 1, in 1958. In the decades since, scientists have learned that the size of the two belts can change – or merge, or even separate into three belts occasionally. But generally the inner belt stretches from 400 to 6,000 miles above Earth’s surface and the outer belt stretches from 8,400 to 36,000 miles above Earth’s surface. A slot of fairly empty space typically separates the belts. But, what keeps them separate? Why is there a region in between the belts with no electrons? Enter the newly discovered barrier. The Van Allen Probes data show that the inner edge of the outer belt is, in fact, highly pronounced. For the fastest, highest-energy electrons, this edge is a sharp boundary that, under normal circumstances, the electrons simply cannot penetrate. The team looked at possible causes. They determined that human-generated transmissions were not the cause of the barrier. They also looked at physical causes. Could the very shape of the magnetic field surrounding Earth cause the boundary? Scientists studied but eliminated that possibility. What about the presence of other space particles? This appears to be a more likely cause. This scattering effect is fairly weak and might not be enough to keep the electrons at the boundary in place, except for a quirk of geometry: The radiation belt electrons move incredibly quickly, but not toward Earth. Instead, they move in giant loops around Earth. The Van Allen Probes data show that in the direction toward Earth, the most energetic electrons have very little motion at all – just a gentle, slow drift that occurs over the course of months. This is a movement so slow and weak that it can be rebuffed by the scattering caused by the plasmasphere. This entry was posted in ASTRONOMY, ASTROPHYSICS and tagged Van Allen. Bookmark the permalink.